Life’s incredibly tough being an Australian pop star. You not only have to battle to be heard on the airwaves in your own country, but opportunities to be seen on TV screens by the wider public are also few and far between. Add in a public who consistently demand better songs and better videos while becoming increasingly less likely to actually dip their hands in their pockets and buy the product and you understand why some are more than willing to leave the game. But Samantha Jade has been ensconced in the business for long enough to understand that there will always be ebbs and flows and after a personally turbulent 2014, she’s emerged with both a positive mindset and a fresh new single. We sat down with Samantha to chat about ‘Shake That’, the industry as a whole, dealing with trolls, as well as that Woolworths campaign. And yes, she tells us her long-awaited new album is definitely on the way. But she begins by admitting that though life for any Aussie artist is tough, she’s more than ready, willing and able to roll with the punches. “If you’re a hard worker and you have high expectations, it’s always difficult,” she begins. “I put a lot of pressure on myself and my team and always hope to be better than the last record and better than the last video. But at the same time, you do have to find some sort of appreciation and excitement in that. As mentioned in the opener, one of the biggest challenges facing Aussie artists is a lack of platforms to showcase new material, both on TV and via a commercial radio community which is largely reluctant to support our own. “There are only a few TV moments a year,” Sammi admits. “There’s really only ‘Dancing With The Stars’, ‘The X Factor’ and ‘The Voice’. That’s kind of it. So if you don’t have a song out in that bracket, you’re obviously not going to get that ‘moment’, so it does make it a little harder. “Australia’s got a big ‘loungeroom culture’ I like to say. Aussies are pretty down to earth, pretty normal. We like to get to know someone; that’s why I think those shows work so well. We’re part of the process and we feel like we build the artist too. So I feel like when you do perform on ‘The X Factor’ or something like that, you have the little interview and they get to know you a bit more. So those moments really help. Samantha was in the music business long before she set foot on the ‘X Factor’ stage. She’d signed a label deal with Jive Records in the US in the mid-2000s, contributed a song to the ‘Step Up’ soundtrack back in 2006 and even featured on this little website with her 2009 single ‘Secret’ (HERE), all before ‘The X Factor’ stage beckoned. And it’s clear the people loved what they saw and heard, crowning her the winner of the competition back in November 2012. But there have been plenty of competitions since and there are a number of other Aussie pop starlets competing for the same time on local airwaves. We ask Sammi how hard it is for her to find her own niche in such a crowded marketplace. “It’s something I don’t focus on,” she admits. “I think when you focus on that, it makes it a little harder to stand out because you’re wondering ‘oh what’s my thing?’. When you’re just you, you are you and everyone is different. My music’s probably the most pop-driven out of the girls I can think of in my category and we’re all a bit different style-wise. So there’s room for everyone. And, of course, that competing for airtime is just within the bunch of Aussies. Samantha and her peers then have to compete against the best artists in the world, whose music often dominates our airwaves. “It’s hard in Australia. Australia’s our market and it’s the only one we’ve got. UK artists, American artists, they’ve got their place and they’ve got ours. We all talk about it… Wishing that we could just branch out or have that moment. But it’s understandably difficult to continue to be so positive in the face of trolls. We’re staggered to learn that Sammi, who’s literally one of the sweetest pop stars you could ever hope to meet, has been the victim of the vile internet trolls. She also copped plenty of flak for appearing in the high profile campaign for supermarket chain ‘Woolworths’ earlier this year. “Oh yeah, I expected that,” she says, revealing that it wasn’t the money that prompted her to do the campaign. “I wouldn’t do anything unless I really wanted to do it. I was a struggling artist. I’m not used to having money. Money’s never been the motivator for me. But some people think that way. A lot of it’s self promo. If you’re a struggling artist, you do it because you love the music and you get the benefits. Now, however, it’s all about her recently-released single ‘Shake That’. Co-penned and produced by the legendary Kenny (Babyface) Edmonds, it’s a song with an incredible pop pedigree and Samantha tells us how it came about. “I’d actually worked with Babyface years ago when I used to be signed to Jive,” she reveals. “We did a ballady kind of song and it was amazing and he’s amazing. He’s Babyface. Come on… he’s one of the greats. “So I went in and this girl Carmen Reece came in. You need to wait for her record to come out. She’s crazy. She did the bulk of the Ariana Grande record and her vocals are unbelievable. It’s really fun for someone who can really sing like that to write a melody for you, because they know what you can do and where it will be fun to play. “We were actually recording another song that we’d written together, I came out to get my coffee and she said, ‘I know this is really random and we’re in the middle of another session, but I have this song that you won’t be able to write on because it’s already written, but I just feel that I need to play it for you and I think you’re going to love it’. I’m not precious about the writing thing though. Pitbull’s association with the single, however, came about only in the “last few months”. “I recorded it in January, but there was a bridge in the song that was bare. So Carmen said, ‘Well you could write a part there if you want’ and usually, you’d try and get writer’s credit – everyone tries to get on. But it wasn’t right. There wasn’t anything more to say in the song and I didn’t think you needed to hear me again at that point. I felt like it needed to be someone else’s voice. With ‘Shake That’ now under her (tiny) belt, talk quickly turns towards that all-important album. In our last interview with Sammi, in late 2013, she told us that it was due in February 2014. And, despite reports to the contrary, it’s not called ‘Angel’. “Do you know what I think it was? I posted a picture on Instagram of my mum and said that she was my angel. And I think that I had done an interview shortly after that saying that the record was dedicated to her, which it is, and I think they kind of tried to put two and two together and got five. And now in every interview I do, they say… ‘so… Angel’… It’s called something else. Sammi’s also super-excited to tell us about a duet that will feature on the record (“someone who’s really not anyone you’d expect me to have a duet with”), but confirms that it’s not the one she recorded with Stan Walker, ‘Start Again’. And finally, Samantha reveals, we should be expecting the LP to drop in just a few months time. 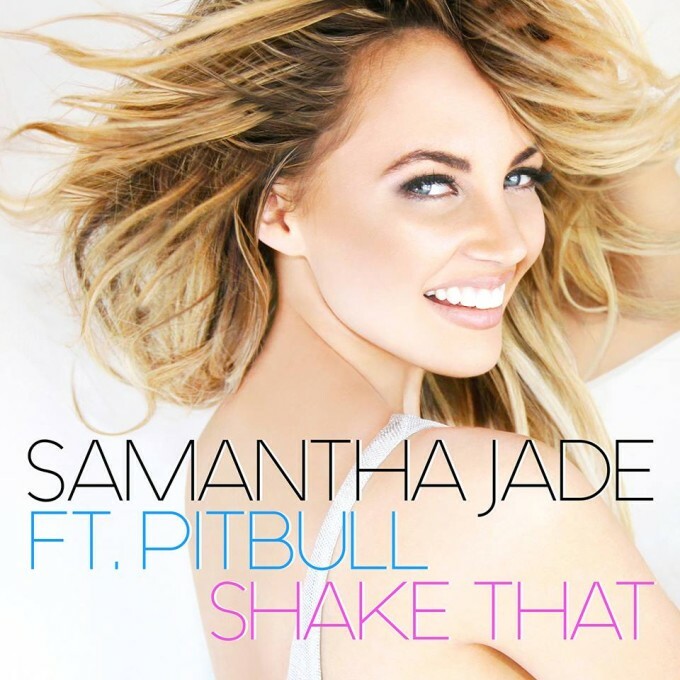 Samantha Jade’s single ‘Shake That’ is available now. Her long-awaited debut album, she says, is due in October.